The Des Moines Fairgrounds Gun Show will be held next on Jun 28th-30th, 2019 with additional shows on Sep 20th-22nd, 2019, Oct 25th-27th, 2019, and Nov 29th-Dec 1st, 2019 in Des Moines, IA. 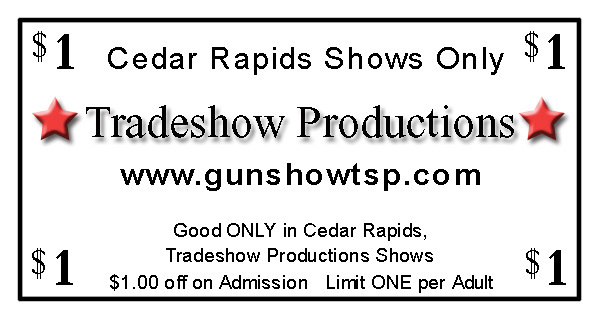 This Des Moines gun show is held at Iowa State Fairgrounds and hosted by Trade Show Productions. All federal, state and local firearm ordinances and laws must be obeyed. Best gun show in Iowa. I hope this is better than the last one in March, people wanted way to much for lower parts kits. Had to buy off the Internet. A couple of Dealers that were selling the CMMG kit you said that the company raised there prices. Then I took out and showed them how was it I could go to there website and buy it for $45 to $50. Then I was told if I was not going to buy anything to just move on. Needless to say I will no longer be purchasing anything from them ever agai. The one dealer I have done business with for over 8 years. I want to buy local and at gun shows that are here but when they out right lie to you. They no longer get my money period. And I had noticed later on that Saturday one guy lowered his price. So it’s only fair to let fellow hunters and gun builders know when people are gouging prices. So from now on I will be the red neck and let people know where they can get better deals. Solid show for sure. Please bring your cash as cash is king to getting sweet deals. Excellent show and some great deals on AR’s. The last show I attended was in April at Fairgrounds. If you take some time and search you can find some good prices. Hope they have good prices this time . Last time was looking for lower receiver parts kit and everyone want $ 70.00 and more and the $ 70.00 dollar ones did not come with firing group or pistol grip.